Sewing Dude | Discussing the manly art of sewing in a totally confident, manly way. Discussing the manly art of sewing in a totally confident, manly way. Help! My [________] is frozen!!! So-called “vintage” sewing machines are now over 40 years old and in many cases, especially closet queens, the grease and oil has dried up inside them. Even worse, some people would use 3-in-1 oil for lubrication because it was cheaper and easier to find than real sewing machine oil. 3-in-1 oil has a bunch of additives in it. Once the oil goes away, it leaves a brown sludge on everything it touches. That sludge eventually turned to a hard varnish decades later. Remove the top/bottom covers over the machine’s innards and open the side where the needle bar goes up and down. If you see a bunch of that brown varnish on the gears and sliding surfaces, you have a 3-in-1 problem, and likely a frozen machine. Apply a good oil (Tri-Flow is commonly recommended) to the mechanisms and work and work and work and work and work the parts gently until they move. Keep oiling and running the machine over and over and over. Tell yourself how you’re sticking it to “The Man” by not buying to the “disposable society” paradigm. As night falls, and your arm cramps have begun to consume your entire consciousness, avoid pandering to the effete thought that you should collect Beanie Babies rather than these #$@#% sewing machines. Do not use gasoline, Naptha, Xylene or other strong solvents near vintage machines to “speed up” the process. Some older plastics (like Bakelite) can be damaged, or even dissolve into a taffy-like mess simply from fumes. Getting impatient or physically rough with anything can ruin irreplaceable parts. Use good grease (Tri-flow recommended, but fishing reel grease is acceptable) on METAL gears (not Delrin) and oil on sliding or twisting parts once the machine operates properly again. Be sure to run some scrap fabric at high speed through the machine before doing real sewing, as sometimes old crud and stuff oozes out of unexpected places after this process. Using rubbing alcohol, get any oil (or grease) off of rubber belts or bobbin winder wheels and their pulleys. Nu-Finish car polish is excellent for making painted and chromed parts sparkle again. Given enough time, and assuming no one has botched up the mechanisms with amateur “repairs” or adjustments in years past, you will be rewarded with a machine that is many, many times higher quality, smoother, and more durable than the plastic crap now sold in big-box stores. Not having electronics in your new toy is a big advantage too. My neighbor with the $2,500 Viking found this out when a circuit board malfunctioned after six years, and the part is no longer made. The machine will literally do nothing — so she bought a Bernina for even more money. The Bernina is very smooth and impressively well-made, but the accessories are heart-attack expensive and the new unit ALSO has electronics. Many older machines have defined oiling points, and DO NOT require gobs of oil to be sprayed all over them to function reliably. Less is more, and the manuals for your, or a machine in the same family, will identify the places to lubricate. Congratulations! If this was the personal machine of a deceased relative, you truly have something special to be proud of. If this was a $5 garage sale junker you’ve returned to service, and saved from the landfill – stand tall! More repair tips at NEW HOME of the Vintage Singer Group. Note: Tri-Flow and Nu-Finish may be available in your local auto parts store or elsewhere online. The Amazon links are NOT affiliate links, and are for your convenience. I don’t get paid, so the person who wrote me the nasty comment (since deleted) can have a REAL NICE DAY. If you are seeking info on your machine, especially repairs, this is the place to be. However, it is proper etiquette to run a search first before asking for help. Many of the same questions get asked over and over (sometimes weekly) and this can provoke a chilly reception towards people who do not demonstrate due diligence in self-education prior to seeking expert assistance. Several of those guys (a few in their 70s and 80s) formerly worked as factory techs for Singer, and can probably tell you the official part number for every screw in your machine off the top of their heads. That site is a veritable encyclopedia of knowledge on Vintage Singers, of which (sadly) fewer and fewer guys remain each year. 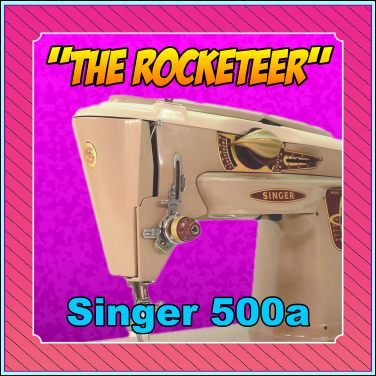 If you are having trouble diagnosing your vintage Singer machine, there is no better resource on the web than the Yahoo Vintage Singer Forum. You can request membership (done to limit spam) from this page, which sometimes takes a few days. Protip: search the archives before asking a question. Many topics come up again and again, and long-time members of this group can be testy about repeating easy to find information. 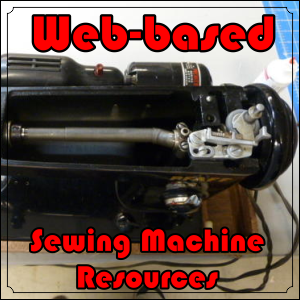 The same can be found for Kenmore machines at Yahoo Vintage Kenmore and Old Kenmore Sewing Machines, with the same caveats on “search before asking” for frequently covered topics. Needlebar.org contains endless archives of information on machines from the 1800s- forward to obscure makes and European models. Hard to find parts and common replacements (at fair prices) can be found at Sew Classic, along with more free downloads and knowledgeable advice at the blog attached to the online store. Note: If you are an eBay parasite who downloads free manuals and then sells $10 “electronic copies” of a file (you neither scanned, printed, or bound) to unsuspecting people, rest assured that Santa will hear about this – and you’ll be sorry.